Malaysia is looking for seven other North Korean suspects, four of whom are believed to have left the country on the day of the killing. 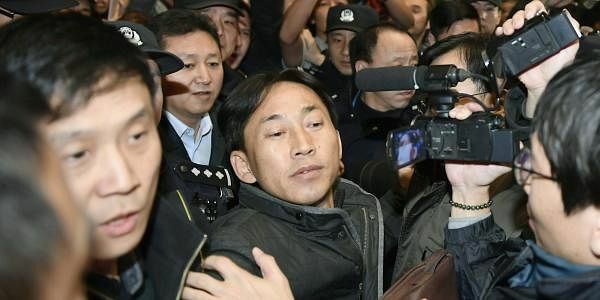 KUALA LUMPUR: A North Korean chemist deported from Malaysia accused police of threatening to kill his family unless he confessed to the assassination of the half-brother of North Korea's leader, calling it a plot to tarnish his country's honor. Ri Jong Chol spoke to reporters in Beijing early Saturday while on his way to Pyongyang. Malaysian authorities have said there's insufficient evidence to charge Ri over Kim Jong-Nam's killing at Kuala Lumpur's airport on Feb. 13. Ri was detained four days after the attack but police never said what they believed his role was. Two women — one Indonesian, one Vietnamese — have been charged with murder after police said they smeared Kim's face with VX, a banned nerve agent considered a weapon of mass destruction. Ri said he wasn't at the airport the day Kim was killed but that police accused him of being a mastermind and presented him with "fake evidence." He said they showed him a picture of his wife and two children, who were staying with him in Kuala Lumpur, and threatened to kill them. National police chief Khalid Abu Bakar told the AP he will hold a presser on Tuesday to respond to Ri's comments. Immigration Director-General Mustafar Ali said Friday that Ri has been blacklisted from re-entering Malaysia. Police on Friday issued an arrest warrant for the Air Koryo employee, Kim Uk Il, but didn't say why he is a suspect . Police say he arrived in Malaysia on Jan. 29, about two weeks before Kim was killed. Kim's death has unleashed a diplomatic battle between Malaysia and North Korea. Malaysia said it was scraping visa-free entry for North Koreans, while the Foreign Ministry said it was "greatly concerned" about the use of the nerve agent. Malaysia has not directly accused North Korea of being behind the killing, but the ministry statement came hours after a North Korean envoy rejected a Malaysian autopsy finding that VX killed Kim. Ri Tong Il, a former North Korean deputy ambassador to the United Nations, said that the man probably died of a heart attack because he suffered from heart disease, diabetes and high blood pressure. He said that if VX had been used, others besides Kim would have been killed or sickened. Malaysian police have brushed off Ri's claim of a heart attack and insisted he was murdered. The two female suspects at an airport terminal were caught on grainy surveillance video smearing what Malaysian authorities say was VX on his face and eyes, though both reportedly say they were duped into thinking they were playing a harmless prank. Kim died within 20 minutes, authorities say. No bystanders reported falling ill.
Police said the women had been trained to go immediately to the bathroom and wash their hands. Police said the four North Korean suspects who had left the country put the VX liquid on the women's hands. Police can't confirm whether the two women may have been given antidotes before the attack. An antidote, atropine, can be injected after exposure and is carried by medics in war zones where weapons of mass destruction are suspected. North Korea is trying to retrieve Kim's body, but has not acknowledged that the victim is Kim Jong Un's half brother.